The market for lidar UAVs and their applications is growing fast and and will continue to increase over the next decade. In 2015, the figure spent on drones using Lidar was around the USD 300 million. However the lidar market is expected to rise to more than $1 billion by 2020. This is an increase of 20% year on year to 2020. Many still view airborne lidar applications through the use of fixed wing pilot aircraft. The high cost or renting lidar equipped aircraft, pilots, lidar trained engineers has kept the use of this extremely useful technology pretty much to the minimum. Only big money and big budgets could afford to use airborne lidar systems regularly. With the huge leaps in drone innovation and technology, we can see a big move away from the high cost fixed wing aircraft to the the lower cost and more efficient UAV lidar model. Drone manufacturers are developing models which are adaptable for a range of cameras and sensors including lidar. Manufacturers such as DJI with its Matrice 100 and 3DR with it’s X8-M are very adaptable for lidar sensing equipment. The manufacturers of lidar sensors also see the potential of the UAV market. These manufacturers are pushing towards creating lighter and smaller lidar sensors specifically for the UAV market. This is already happening in photogrammetry and in aerial surveying. There are many projects from commercial to governmental, environmental and conservation which have tight budgets and could not afford the high cost of hiring lidar equipped aircraft services. These sectors are starting to take advantage of the low cost of UAV lidar systems. Light Detection and Ranging (Lidar) by definition is a remote sensing method which uses pulsed laser light to measure ranges (variable or changing distances) to the Earth. The lidar instrument fires rapid pulses of laser light at a surface, some at up to 150,000 pulses per second. Light moves at a constant and known speed so the lidar sensors can easily calculate the distance between itself and the target with high accuracy. By repeating this in quick succession the instrument builds up a complex ‘map’ of the surface it is measuring. With airborne lidar other data must be collected to ensure accuracy. Lidar uses ultraviolet, visible, or near infrared light to image objects. As the sensor is moving, the height, location and orientation of the instrument must be included to determine the position of the laser pulse at the time of sending and the time of return. This extra information is crucial to the data’s integrity. Each point in the point cloud has three-dimensional spatial coordinates (latitude, longitude, and height) which correspond to a particular point on the Earth’s surface from which a laser pulse was reflected. The point clouds are used to generate other geospatial products, such as digital elevation models, canopy models, building models, and contours. Lidar can also target a wide range of materials, including non-metallic objects, rocks, rain, chemical compounds, aerosols, clouds and even single molecules. Lidar is used in so many sectors at present on a limited basis. lidar is going to move into more areas and being used more frequently within these sectors. The only limiting factor to the use of UAV lidar technology has to be our own imaginations. One of the best uses for lidar is in the analyzing of data within the environmental conservation field. Many conservation projects are local community, city or county based without having a big budget. With lidar mounted on UAVs, using drones in locally based community projects will increase dramatically. Having an aerial view as well as building topographic maps will benefit all conservation projects immensely. Protecting our natural habitats for both wildlife and ourselves is important. All life is important and to be surrounded by unspoiled natural beauty whether it is lakes, parks, forest or coastal region is something to cherish. Without doubt, lidar UAVs will have a huge impact in this sector. Here’s a list of UAV lidar applications. This Sector is pretty big and increasing through the use of drones adapted to carry lidar sensors. Agriculture: Used to reveal slopes and sun exposure on farm land. Agriculture: Blend topography maps with crop yield data to indicate health of soil. Archaeology: Locating and mapping features beneath forest canopy. Archaeology: Site surveying and aiding in the planning of digs. Meteorology: Lidar systems profile clouds, measure wind speed and quantify atmospheric components. Environmental Conservation: Lidar has many applications in accessing and analyzing rivers, lakes, coastal regions, climate, forest fire hazards, land based threats to Coral Reefs, measuring biomass areas and protecting forestry. Forest Conservation – Measure the structure and density of the forest canopy and compare with surface data. Mining: Lidar is used to calculate ore volumes by periodic UAV flyovers and comparing surface data to previous scan. Surveying: UAV with lidar sensors are used create many types of DEM (Digital Elevation Model). Contour Mapping: Creating topographic maps, which shows valleys, hills and the steepness of slopes. Solar Energy: Lidar to assist City and County planners on how best to optimize solar photovoltaic systems. Obstacle Avoidance: All types of autonomous vehicles including UAVs use lidar for obstacle detection and avoidance. Here is a nice video from Dr Nicholas Coops who provides an introduction to lidar for natural resource management. Nicholas describes lidar very well along with the it’s tremendous benefits. Generally UAV lidar systems use 1064 nm diode pumped YAG lasers. Sensors can be distinguished based on the scanning method, i.e. how the laser beam is directed through the surface. The four most widely used sensor types are shown. The speed at which images can be developed is affected by the speed at which it can be scanned into the system. 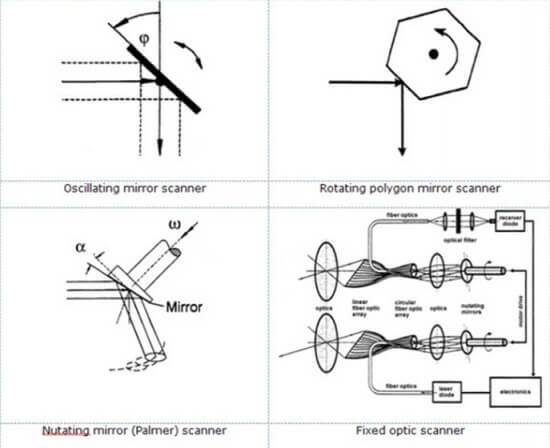 A variety of scanning methods are available for different purposes such as azimuth and elevation, dual oscillating plane mirrors, dual axis scanner and polygonal mirrors. They type of optic determines the resolution and range that can be detected by a system. The photodetector is the device that reads and records the signal being returned to the system. There are two main types of photodetector technologies, solid state detectors, such as silicon avalanche photodiodes and photomultipliers. When a lidar sensor is mounted on a mobile platform such as satellites, airplanes or automobiles, it is necessary to determine the absolute position and the orientation of the sensor to retain usable data. Global Positioning Systems provide accurate geographical information regarding the position of the sensor and an Inertia Measurement Unit (IMU) records the precise orientation of the sensor at that location. These two devices provide the method for translating sensor data into static points for use in a variety of systems. Autonomous flight using waypoint navigation is essential to working with lidar sensors and instruments. With autonomous waypoints, you just need to program in the flight path or area to cover. The UAV will keep to this flight path better than any manual piloting. The flight systems on the top drones today, re-align themselves hundreds of times every second to keep them still in in blustery conditions. Below are listed a number of lidar sensor manufacturers, drones which lidar sensors can be mounted and also a couple of lidar solution providers. Another terrific article read is the top ten lidar sensors for UAVs. Leica manufacture affordable city mapping lidar systems with their industry leading 1.0 MHz pulse rate, which is easily upgradable to a full-capability configuration. Leica systems produce high density point clouds for corridor, urban, flood plain and general purpose airborne mapping in a fraction of the time it took previously. Leica have 9 airborne lidar systems. However, all of these are large and heavy lidar sensors more suited to gyrocopters. Geodetics create a number of lidar sensors for UAVs. The Geo-MMS SAASM is a fully integrated lidar mapping payload which mounts onto small UAVs. 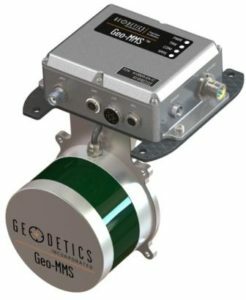 The Geo-MMS includes an inertial navigation system, which uses a SAASM GPS sensor with a path to M-Code, along with the lidar sensor. The raw data from the integrated GPS, IMU and lidar sensor is recorded on the internal data recording device and can be post-processed using Geodetics’ lidar tool software package to directly geo-reference the lidar point clouds. Phoenix are a leading manufacturer of UAVs with integrated aerial lidar products. They have two terrific lidar UAVs called the Scout and Ranger. The Scout UAV uses the Velodyne VLP-16 Puck lidar sensor (see below), which features 16 lasers aligned over a 30º Vertical Field of View, 100+ meter range and captures up to 300,000 measurements per second. The Ranger is by far the most accurate and longest range lidar mapping system which Phoenix offer. Their lidar UAVs are ideal for mapping power lines, pipelines, railway tracks and anything else where accuracy is essential. Phoenix Aerial have 6 UAV lidar Mapping Systems. The Velodyne lidar sensors are perhaps the most advanced lidar sensors on the market. The Velodyne’s PUCK™ VLP-16 lidar sensor is the smallest and product in Velodyne’s 3D lidar product range. It is vastly more cost-effective than similarly priced sensors and developed with mass production in mind, it retains the key features of Velodyne’s breakthroughs in lidar: Real-time, 360°, 3D distance and calibrated reflectivity measurements. Vellodyne latest product is the HDL-32E LiDAR sensor for UAVs. It is small, lightweight, ruggedly built and features up to 32 lasers across a 40° vertical field of view. 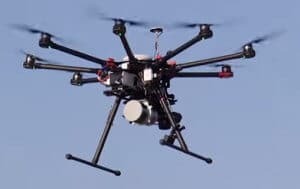 The HDL-32E measures only 5.7″ high x 3.4″ in diameter, weighs less than two kilograms and was designed to exceed the demands of the most challenging real-world autonomous navigation, 3D mobile mapping and other LiDAR applications. Vulcan can build standard, custom and bespoke multirotor UAV systems for many applications and sectors including lidar. Vulcan UAV are the preferred supplier of UAVs for the new LidarPod from RouteScene. The X8-M from 3DR is totally adaptable and can be customized for various cameras and sensors. The X8-M has all the technology you need and is perfect for lidar applications and many other uses. 3DR have now stopped manufacturing the X8 UAV. Their SOLO drone is adapatable for photogrammetry so there are 3rd parties expect further adapting the SOLO for lidar sensors. Note: In November 2016, 3DR announced they would stop producing drones and concentrate on 3D Imaging and Photogrammetry solutions such as their SiteScan product. 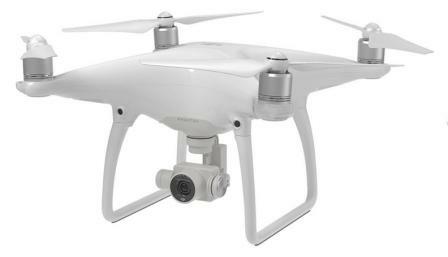 DJI have 4 drones which can be customized for a range of cameras and sensors. The Matrice 100 is stable, modular, and fully programmable. The Matrice 100 is a powerful platform which is adaptable for many uses. 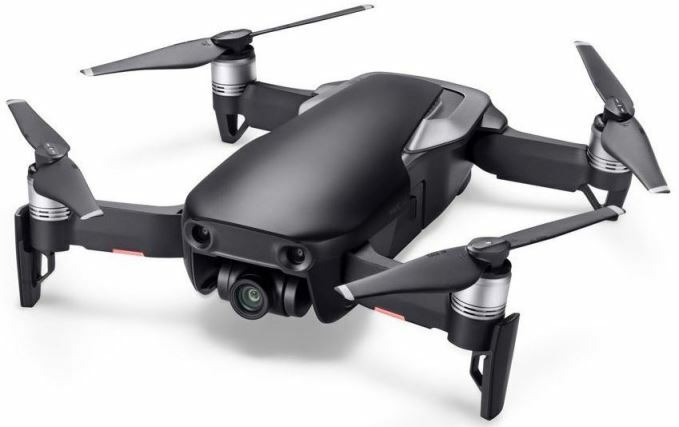 Another terrific drone is the DJI Spreading Wings S1000+ multirotor which is extremely adaptable and can carry various cameras, gimbals and sensors. It has a dual parallel CAN and API ports for connecting DJI devices including the Guidance sensor system, the D-RTK GNSS units or third party components of your choice. In the below video we see the Spreading Wings S1000 mounted with the AL3-16 lidar mapping system. The AL3-16 can be fitted on any UAV which can carry a payload of 2.5 kg. The Spreading Wings S1000 is perfect for many lidar applications. Working outdoors with lidar sensors attached to a UAV and then developing the data to create maps and models is pretty exciting. It certainly is an adventure. To learn anything new takes some time but it is well worth it. Working with lidar is a great career move and as business, lidar services are in high demand. Here are some resources if you are new to the world of lidar. These will get you up to speed pretty quickly and then you can follow and more advanced path. Quick and simple Introduction To Lidar training course. The ESRI have 3 online lidar courses. The 1st course is a free seminar which provides an overview of lidar capabilities using the geographic information system called ArcGIS. This system is used for: creating and using maps; compiling geographic data; analyzing mapped information; sharing and discovering geographic information; using maps and geographic information in a range of applications; and managing geographic information in a database. The other two courses from the ESRI include hands-on exercises and are geared toward data managers and analysts. Don’t forget to check with local colleges in your area for lidar or even GIS training. In some ways classroom training is still the best. To finish off this post, here’s a nice video showing you exactly how lidar and remote sensing works.